There’s a new paper just out in J Neurosci by Dan Butts et al. (2011) that offers some key insights into temporal precision in the lateral geniculate nucleus (LGN). 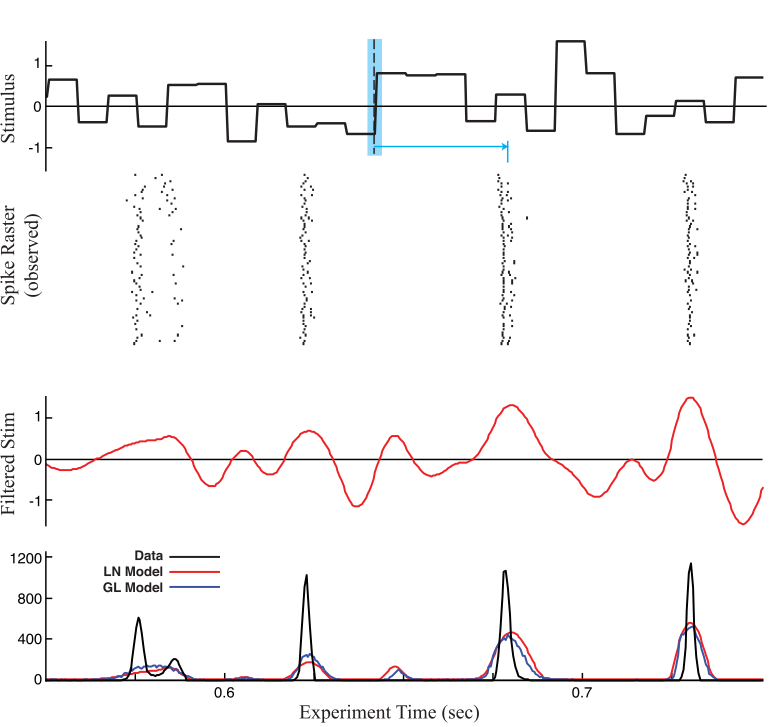 The spike trains of LGN cells are remarkably regular; while a Poisson train has Fano factor (variance to mean ratio) of 1, and cortical neurons in areas like MT frequently range around 1.2-1.5 (Dayan & Abbott 2001), retinal ganglion cells and LGN neurons can reach Fano factors of 0.2 or less (Berry and Meister, 1998). 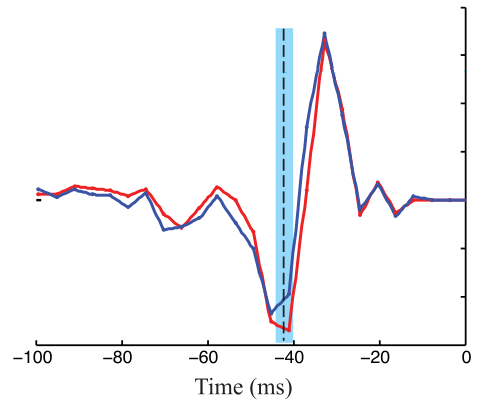 In fact, LGN spike trains are so precise that the jitter of the first spike within a burst event can vary with a standard deviation smaller than 3 ms from trial to trial (Keat et al. 2001). What purpose this precision serves has been the subject of intense speculation. One hypothesis (Butts et al. 2007) is that such precision increases the rate of information transmission and enables more accurate representations of the visual world. 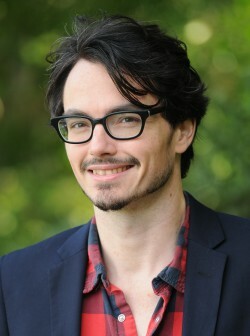 The 2011 paper explores how this precision can arise computationally. 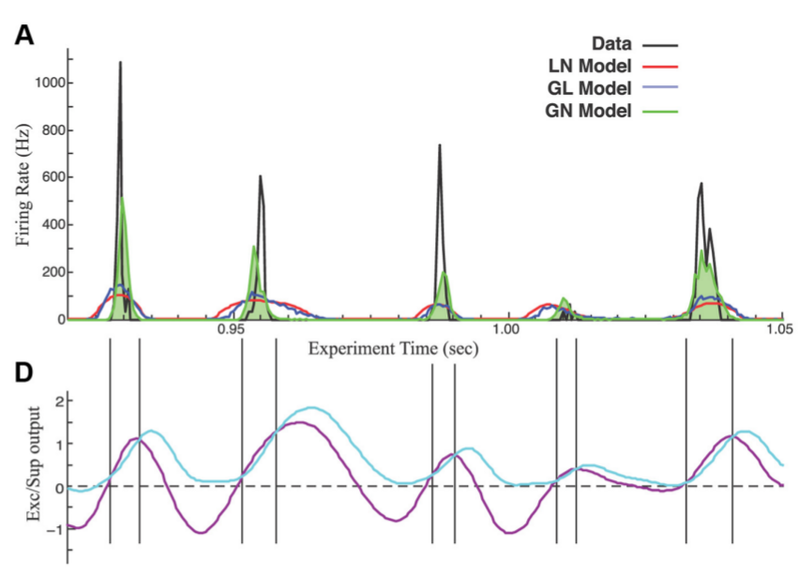 Using standard reverse correlation or generalized linear modeling (GLM) methodology, it is possible to estimate an LGN neuron’s first-order temporal kernel. With full field high contrast stimuli, this results in a bimodal kernel (above). When convolved with the original stimulus, this yields a linear response whose dynamics are very sluggish compared to the timescale of LGN responses (below). While the spiking threshold decreases the timescale of the predicted response, it’s impossible to find a single threshold that can both let through burst events associated with weak drives while limiting the length of events associated with strong drives. The authors propose a generalized nonlinear model (GNM) to account for this baffling precision. 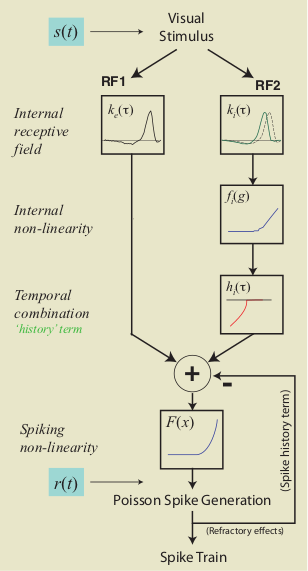 Standard linear models lump together excitatory and suppressive influences. A negative term in the temporal response function means that a positive stimulus — a white pixel — causes a suppressive drive while a negative stimulus — a black pixel — causes an excitatory drive. This is also true if the linear filter is followed by rectification or thresholding. In other words, in a linear model with symmetric (positive or negative) inputs, there is no true suppression. The authors propose that the response of LGN cells is determined by a combination of an excitatory drive and a suppressive drive, which are then thresholded (above). The excitatory drive is as in a linear model. The suppressive drive is composed of a linear filter whose output is modified by a nonlinearity determined from the data; the output is delayed before combining with the excitatory drive. The intermediate nonlinearity is key here, as it allows the model to express true suppression. Most commonly, the nonlinearity found is a half-rectifier, and the excitatory and suppressive filters are similar but slightly delayed. The effect is that the response is quickly shut off after a strong excitatory drive; no such effect results with weak or suppressive drives. This gives the desired temporal precision (below; purple line is excitatory drive, aqua is suppressive), and translates into very sizable R^2 increases, on the order of 2 times better than a GLM (with 2 ms bins). They suggest in the discussion that if the suppressive component of the response is modulated with contrast, the model reproduces both the gain and shape changes of the impulse response function of LGN cells as a result of contrast adaptation. Unfortunately this is only suggested by simulations, and I would have liked to see the model fit on the same cell stimulated at different contrasts. Nonetheless, it’s an intriguing possibility that the observed precision of LGN cells is ultimately derived from the same mechanism underlying contrast gain control.